The Original Gospel Sounds: Welcome! Over thirty years ago in Evansville, Indiana, a handful of people got together and started singing for the Lord. From this small group came the Southern Gospel quartet known then as the Gospel Sounds, which grew into a full-time ministry in the late 1970s. The Gospel Sounds disbanded in 1981, but the members of the group continued to grow in ministry. Paul continued his evangelistic ministry; Eddie & Lori became a part of a pastoral ministry; David East began a evangelistic music ministry; David Heard became married and then began an evangelistic ministry; Steve Montgomery became married and then worked in music ministry within his local church. In October 2006, the Gospel Sounds reunited for a special Pastor's Appreciation Day homecoming service at the East Side Church of God in Evansville, Indiana. Now, over twenty-five years since the group disbanded, the original Gospel Sounds have officially reunited and are once again singing under the anointing the Spirit provides. 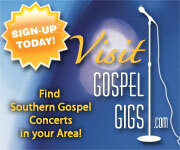 Southern Gospel concerts in your area. "Sounders" are registered members of the Gospel Sounds fan club. Joining our fan club is free and easy. Click here to join! but He taps His feet to Southern Gospel."